In the wave of EAB and amid some park reconstruction projects, the folks in the village of DeForest thought, “why don’t we put some of these trees to work for us.” After decades of providing shade and shelter, several large ash trees came down in Fireman’s Park. Park staff thought it would be fitting to reuse what they could from these stately trees whose fate had been sealed by EAB, which was confirmed in DeForest in 2015. When the new shelter and concession stand were built, ash trees from the park were used for interior trim and a feature wall. The ash were harvested and processed locally by Dave Arnold of City Wood Treecycling. The wood was simply treated with a steel wool vinegar mix to provide a weathered but modern look. The project was so successful that when designing their new sports facility staff asked their architectural firm, Aro Eberle, if there was any way they could utilize ash at the new sports complex building. 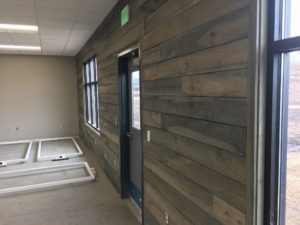 The architectural firm did some research and suggested using thermally modified ash as the primary wood for the exterior trim, facia and siding. Thermal modification is a newer technique being used to treat several types of wood, making species that were not readily usable before, available now. This game changing treatment allows otherwise low valued wood species to be decay resistant when exposed to the elements and results in improved durability and increased dimensional stability. 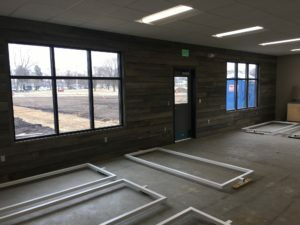 Minnesota Natural Resources Research Institute scientist, Matt Aro, states, “thermal modification is also a chemical-free process, making it even more impressive.” The process may sound simple, but, this process makes numerous changes the wood. “Lumber must be heated to above 320 degrees Fahrenheit in a low-oxygen atmosphere to produce chemical and physical changes in the wood’s cellular structure,” says President Hal Mitchell of Atlanta Hardwood Corporation. Each species and thickness of wood requires a unique treatment temperature and duration to achieve proper modification, but more research is required on Wisconsin’s native species to understand their requirements. Mitchell also commented that product quality can vary due to initial lumber quality, treatment recipes, and kiln types. DeForest sent 6,800 board feet of lumber, initially processed by City Wood Treecycling, to tamper in Superior, the closest firm providing the thermal modification process. Staff are excited for the new building and are pleased that they will be able to showcase the beautiful wood that came directly from their community and supported local jobs in the processing. While the village waits for their new facility to be constructed they are utilizing a portion of the thermally modified ash to build picnic tables, which will adorn the outside of the new shelter at Fireman’s Park and provide seating in their new concert area. DeForest is proud that they have been able to utilize and feature these magnificent trees in their new parks projects. Utilizing the ash wood has been another way to bring attention to the EAB issue and DeForest’s challenge to keep planting and caring for trees so the community can continue to have an urban canopy in the future. For now, it is great to see the ash trees being used in ways that continue to shelter and support residents as they participate in recreational actives across the community. For more information contact Ellen Clark, Communication Specialist, by email at EllenA.Clark@wisconsin.gov or via phone (608) 843-6248.